When can a baby eat eggs? Did you know? One egg contains 13 essential vitamins and high-quality protein. No wonder, it is one of the best foods we can give our children. What’s more, it’s delicious too! But wait, when we say ‘children’, would that also mean babies of less than one year? Can babies eat eggs? There is confusion on this because of the allergic nature of the food. Doctors advise whole eggs and egg yolks as first foods, which can be introduced once the baby is six months. According to the American Academy of Pediatrics (AAP), delaying the introduction of common allergic foods such as eggs will not prevent children from getting atopic diseases. Some pediatricians suggest the parents to wait until eight or even 12 months to introduce egg white as it is not easily digestible. You may wait until the baby turns one year, if your family has a history of food allergies. 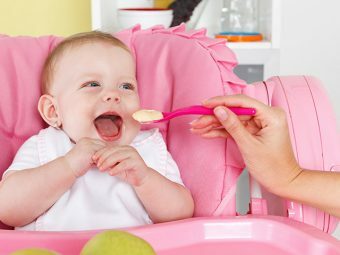 However, AAP says: “Although solid foods should not be introduced before four to six months of age, there is no current convincing evidence that delaying their introduction beyond this period has a significant protective effect on the development of atopic disease. 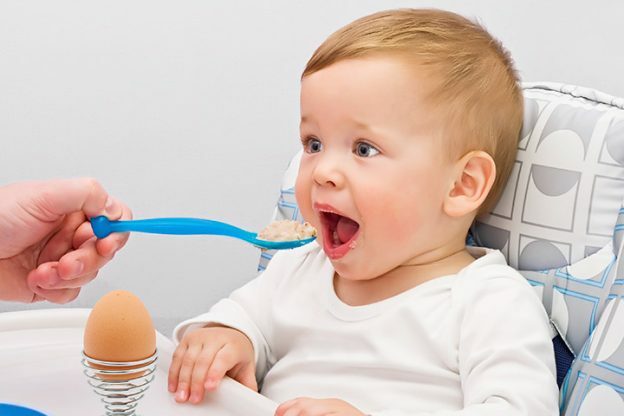 After you feed egg to your baby for the first time, do look out for symptoms of allergies, such as skin hives, diarrhea, runny nose, respiratory problems and more. If you are offering an egg for the first time, just give a mouthful or two. Do not introduce it with other new foods. If you are asking, “But why do I take risk by introducing egg to my baby so early in his life?” then we have an answer. Egg contains cholesterol, proteins, fat, and other nutrients such as iron, zinc, copper, selenium, calcium, fatty acids, vitamins D, B12, E, choline and folate (2). Eggs have second highest-quality protein found in any food, the first being human milk that has lactalbumin protein. Eggs, especially yolks, are easy to chew and digest. Minerals such as zinc, iron, and selenium boost immunity. Folate helps in the production and maintenance of new cells in the body. Egg white is rich in proteins, and potassium aids in the effective functioning of cells and organs. Egg whites support your baby’s body in maintaining the levels of potassium and sodium, and membrane potentials. Glycoprotein in egg white binds to biotin and makes it absorbable by the digestive tract. *The %Daily Value tellsyou how much a nutrient in a serving of food contributes to a daily diet. 2,000 calories a day is used for general nutrition advice. Trivia: Egg whites contain more than half (four of the six grams) of an egg’s protein. 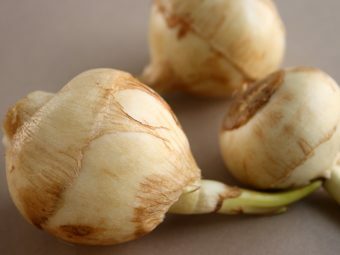 They are low in calories and free of carbohydrates and fats. However, both the egg parts are highly nutritious. Which Part Of The Egg Is Allergenic? The white part of the egg is allergenic. Allergy to egg yolk is very rare. Egg white contains four proteins, which could be allergenic. Several studies have revealed that by the age of five, children outgrow egg allergies. Pick eggs with a British Lion Quality stamp to reduce the risk of salmonella bacteria that causes food poisoning. Grade A eggs are firm white with a centered yolk and an air cell at the wide end. An older egg floats while a fresh egg sinks in water. As the egg ages, the air cell increases making the egg to float. Yolk sits up high in a fresh egg and has a thick white surrounding it. The yolk breaks up easily in an older egg with a thin, liquid white. Spin the egg to identify if it is hard-cooked or raw. A hard-cooked one spins longer than the raw one. This is due to the liquid center in the raw egg that prevents building up of momentum. Organic or non-organic? Non-organic eggs are perfectly safe for consumption, but many prefer organic eggs to avoid chemical contamination. There is no difference between white and brown eggs in terms of nutrition, taste or quality. Eggs from pastured hens: The best eggs come from pastured hens of local farmers. Chicken living in a free-range environment eat nutritious diet, and this would show up in the nutrient content of their eggs. Eggs from pastured hens have more fat-soluble vitamins and other nutrients than the normal eggs do. Note: Dyed eggs are not safe for babies if left outside for more than two hours. The dyes penetrate the egg shell and may pose harm. After you buy fresh eggs, your baby cannot consume them all in one day! Therefore, you need to store them properly in order to keep them fresh for as long as possible. An egg left outside loses more freshness in a day than a refrigerated egg loses in a week (4). According to the US Department of Agriculture, eggs should be stored in their original carton in the coldest area of the fridge (not the door), where the temperature would be 40 degrees Fahrenheit. Original cartons prevent the eggs from absorbing strong flavors of the other foods stored in the refrigerator. Use the eggs as per the ‘best before’ or ‘use by’ date, even if they are refrigerated. To keep the yolk centered, store the eggs with the large end up. Use the refrigerated eggs for babies. Serve freshly cooked eggs but not the leftover or stale ones. How To Cook Eggs For Babies? Boil, poach, fry, or scramble eggs. Offer them as an omelet. Foods having raw eggs such as homemade ice cream, mousses, mayonnaise and baked foods. Salt, butter, sugar or margarine to the egg yolk so that the baby can enjoy the natural flavor of the food. Half boiled eggs. Only a completely boiled egg is free of bacteria as the baby’s immune system is still not fully developed. Use moderate heat and controlled cooking times to prevent the eggs from toughening. How To Hard Boil Eggs For Babies? Boiling eggs continuously for 10 minutes makes the white unpleasant and rubbery. Follow these simple steps to hard boil eggs. Place eggs in a pan and add some cold water. Bring the water to roll boil. Switch off the heat and leave the pan covered for 20 minutes. You may also simmer it for a minute before switching off. Peel the shell when eggs cool down. Cut into pieces and serve as finger food. Below are some delicious egg recipes for babies. Try them out! They are easy to make, and tasty to eat. Peel the shell and cut the egg in half. Pop out the yolk and mash well. Mix it with breast milk, formula, applesauce, yogurt to make egg puree. Foods good to mix with eggs are peas, pears, apples, sweet potato, carrots, cauliflower, rice, lentils, barley, etc. Beat an egg with half tablespoon milk. Heat a pan with a little oil or butter. Pour in the beaten egg and let it sit for a few seconds. Stir this mixture gently, add salt and a little pepper to the cooked egg. Transfer it to a plate when the egg is set but soft. Do not overcook eggs as they become hard and unappetizing. You can also add some grated cheese for added flavor. Whisk an egg with some milk, salt and a little pepper until the yolk and white are thoroughly mixed. Heat butter or oil and gently pour in the egg mixture. Cook until the omelet is set. Make sure that the omelet doesn’t burn. When serving toddlers, you can add stir-fry spinach or stir fry vegetables to make a vegetable omelet. Cook bite-sized pieces of potatoes in olive oil. Once cooked, remove the potatoes and add it to a mixture of eggs, milk, and salt. Cook this mixture as you would cook any omelet. You can also substitute potatoes with tomatoes or bell peppers. Cook the egg mixture in a ring for a tortilla-like effect. Beat an egg yolk with some salt and butter until it is creamy and add it as a filling between bite-sized pieces of brown bread. You can also add mashed butter fruit along with the egg yolk mixture for toddlers. Whole grain bread is ideal for making sandwiches. To make an egg dosa, crack an egg on a dosa just after you spread the batter. Flip it and cook both sides of the dosa. Season it with some salt and pepper. Note: Do not spread the dosa batter too thin. Take a saucepan, turn on the flame, pour in the milk and vanilla extract. Cook below the boiling point. To another bowl, add cornflour, egg yolks, and sugar, and whisk well. Slowly transfer the mixture into the egg yolks, by whisking constantly. Cook the mixture in the saucepan on low-medium flame. Keep stirring to make sure that the custard does not stick to the bottom. Turn off as the custard thickens. Serve it immediately or refrigerate. Mash cooked rice in a bowl and add a spoon full of ghee, pepper, and salt. Mix and mash it well. Serve with egg yolk. Beat the egg in a bowl, add milk and whisk. Add cinnamon and vanilla. Mix well and transfer it to a heatproof bowl and steam. Pressure cook up to two whistles by adding enough water. Beat eggs and add cooled boiled water in 1:1.5 ratio and mix well. Run the mixture through a sieve into a dish that is steam-proof. Set up a rack with water in a wok and bring it to a boil. Put the dish with beaten eggs on the rack. Cover the lid. Lower the flame and steam for 15 minutes. Take out the steamed eggs and top with a dash of soy sauce and sesame oil. Mix all the ingredients well. Mash them to your baby’s preferred texture. Aren’t our recipes tempting enough for you to try immediately? The egg is a good addition to your baby’s diet, provided he is not allergic to it. Give it to him in small portions initially. 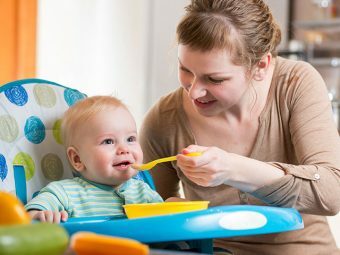 If your family has a history of allergies to egg, wait until your baby turns one to introduce the food to him. 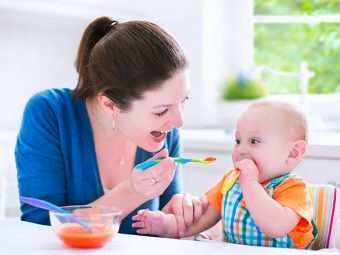 Discuss with your doctor before adding any new food to the little one’s diet! What is your way of serving egg to a baby? Let us know through your comments.